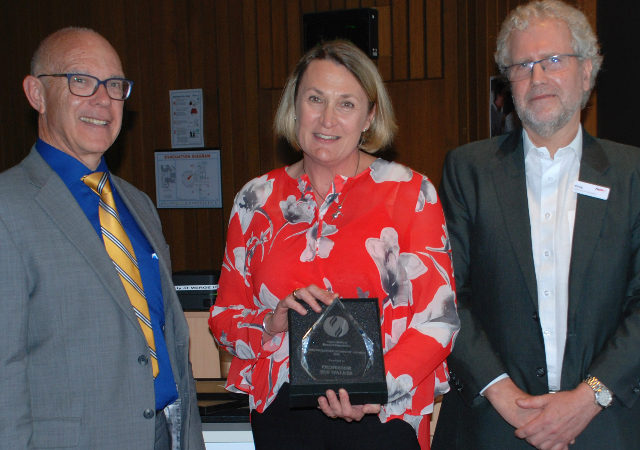 Congratulations to Professor Sue Walker, AO who was awarded the Austin Medical Research Foundation Distinguished Scientist Award at the 2018 Research Fest Awards. The aim of the award is to honour a prominent researcher who has contributed to the research community at Austin Health. Professor Susan Walker, AO is the Head of the Department of Obstetrics and Gynaecology, University of Melbourne, Clinical Director of the Victorian Fetal Therapy Service and holds the prestigious Sheila Handbury Chair of Maternal Fetal Medicine, University of Melbourne. She leads the Women’s and Newborn Steering Group of the Melbourne Academic Centre for Health. At Mercy Hospital for Women, Sue is Head of the Perinatal Medicine Department and co-director of Mercy Perinatal. She has held and continues to hold numerous major research grants and has more than 130 peer reviewed publications. Sue inspires the next generation of researchers through her teaching and research supervision roles at The University of Melbourne La Trobe University and University of Papua New Guinea. In Professor Walker’s acceptance of the award said she was honoured to be recognised as the Austin Medical Research Foundation Distinguished Scientist of 2018 and said that the award belonged to many- the scientists, clinicians, research midwives, students, academic and professional support staff that contribute to research in the University of Melbourne, Department of Obstetrics and Gynaecology at the Mercy. Professor Walker ended her acceptance speech saying, “None of us is as good as all of us. It is such a privilege to be part of the dynamic culture at the Heidelberg precinct”. The Austin Medical Research Foundation (AMRF) supports more than 800 researchers in hospital departments, three University of Melbourne departments and four independent research institutes at the vibrant Austin precinct.